Ob Sie ruhige Zeit auf dem Balkon mit Blick auf den See oder lieber einen Schritt aus und genießen Sie die Natur, ist Logun Landung ein großartiger Ort, um für alle Jahreszeiten zu bleiben. In der Nähe der Stadt, ist dieses Ferienhaus in der wunderschönen Hiawatha National Forest gelegen und 100 'der Sandstrand Fassade liegt auf der Powell-See, einer Quelle gespeist See. Freizeitwegen (Radfahren, Wandern und Schneemobil), ausgezeichnete Jagd und Fischerei sind innerhalb von 50 'von zu Hause oder Ihre Erkundungstouren durch die Hunderte von anderen Seen, Bäche und Wasserfälle, die Sie umgeben. Viele haben in den schönen Sommer genossen, betrachtet die atemberaubenden Herbstfarben oder genossen Wintererholung in Munising, als Mittleren Westen der Hauptstadt für Motorschlitten, Langlaufen und Eisfischen bekannt. Kommen Sie während Ihres Urlaubs zu teilen unseren Lebensstil. Film-Verleih-Option am Gast Kosten, Terrassenmöbel, volle Fuß-out unteren Ebene zur See. Nicht rauchen und keine Haustiere wegen familiärer medizinischen Gründen. Beautiful yet convenient location!!! Lots of places to sleep!! We stayed here for a snowmobiling trip. It was great access to trails and close to fuel! There were plenty of places to sleep. The weather was freezing but the house was nice and cozy and there was enough warm water to shower after a long day in the cold!! :) The garage was convenient to pull our sleds into and we had adequate space to park all three trailers! We had the best time. Can't wait to book again. The house was beyond perfect. Super clean and very well stocked with the necessities. The neighbors were the best and very friendly. The lake was perfect. The bonefire pit was very close to the water but that didn't stop us! There was great access to so many trails. We had a blast exploring them on our side by side. The neighbor even took time to show us our way on some of trails. We were close enough to town for it to be convenient but not so close you felt that "city" connection. We were looking for a great place to do our family "stay"cation and frankly we could not be happier with our choice. We are so hoping to get our schedules together to book again for next year! Great place to stay!! Clean and comfortable! The house is beautiful and sits close to the lake, and is very close to Munising it didn’t take long to get to the grocery store or some of the beautiful waterfalls, beaches, or boat rides. We spent a lot of time hiking to waterfalls throughout the day and went to Miners Beach. We did take quite a long day trip to the Porcupine Mountains and stopped at Bond and Agate Falls along the way. It was a great week and I would gladly do again and especially rent this property again! It was well equipped with all of the kitchen utensils, dishes and pots and pans to make your own dinner. The only thing we didn’t realize was the key on the counter was for the garage and that is where the BBQ was kept. Oops. We just made hamburgers on the stove. Everything is very clean and well kept up! There is no WiFi so are phones were all out of service while at the house so be prepared to have a drive to the gas station to receive or call out if needed. 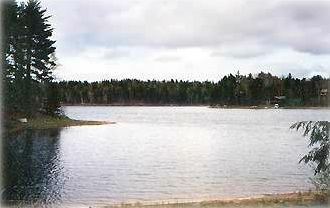 The home is situated very well with private lake view. The interior is really awesome and you feel like you are in mansion. It is very convenient distance from Munising. The perfect place for hanging if you have good amount of people. The home was very clean and meticulous. We cooked our traditional food all three days, grilled chicken (lot), grilled veggies, corns and stuffed green peppers.The owner Karen was so helpful, and was in touch for every interaction I had. We did not felt that we were in vacation home, it just resembled that we are in our own home. The home and ambient surroundings made very positive impression on our minds. Thank you Karen for keeping such a nice home with tons of hospitality. When we plan next time, I will book the same home.!!! Just got back and trip to logins landing was great. We rented pontoon and was a great day for pictured rock tour and the two beaches where can swim . I believe the pontoon rental is the way to go if have number of people, we had nine. The house worked out great with everything we needed. The fishing and row boat was a hit wth the grandkids. I thought the land layout looked bigger in the photos but it worked out. The phone service is nill and same with wifi but it didn't bother me.there was spots at cabin where phone worked but had to hunt to find. Great trip and great family memories was had by all. We ate two meals out and they were so so. Most meals at cabin and we brought most food with us. Thank you, Karen, for the use of your beautiful home. Our extended family of 9 spent a week at Logun's Landing in July of 2017 (ages 9-67). The house was BEAUTIFUL, comfy beds for everyone, clean bathrooms for each family, and plenty of room for all of us. We'd highly recommend this rental to others. We enjoyed sunrises on the deck overlooking the lake and time everyday fishing, swimming, and kayaking on Powell Lake. We brought our own kayaks and a trolling motor for Karen's row boat. The water was warm and clean for swimming right off the deck. The garage was a bonus space to park our bikes, coolers, and extra gear. Logun's Landing was on a quiet, private lake but close to everything. We hiked up local waterfalls (Wagner Falls was our favorite), took a sunset cruise of Pictured Rocks (AMAZING), mountain biked various trails in and around Hiawatha National Forest (including Bruno's Run and Valley Spur), swam in Lake Superior, explored Marquette, and kayaked the Au Train River. It suited our family just fine to be "un-plugged" for the week with no cell service or wifi...but town was just 10 minutes away for groceries, gas, a great bagel shop and ICE CREAM! Also check out the fish tacos and "piggy fries" at Johnny Dogs-Delicious! For those interested in renting in the future: there were plenty of bath towels (we did bring our own beach towels which were useful), there is a nice gas grill, a huge table with 10+ chairs in the dining area plus bar stools, the deck has a great table that seats six. There is a large washer/dryer in the basement, so bring some detergent if you anticipate using it. We also brought games for the kids and a few DVD's for late night movies. We enjoyed the fire pit by the lake but were glad we brought our camping chairs to sit out back and watch the kids swim. The neighbors were also very friendly, even inviting the kids to fish off their deck. What a WONDERFUL week. When the kids say, "Can we come back here next year?" you know you've found a winner! Thanks again, Karen! Rates are subject to change until reservation is confirmed. Additional fee per person per night applies to 18 years of age and older.